Ohh! I'll be playing in a campaign of this soon! Do you know which edition you'll be playing? I've got a review copy of the above and it's not displaying properly in any of my PDF viewers. The printed version doesn't seem to be out yet. I thought the idea of mixing spooky smoky cities, Victoriana and Cthulhu was genius. 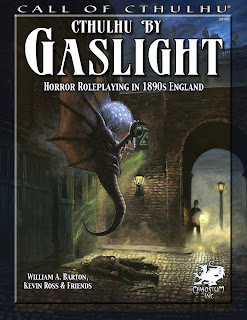 I think at the time, it was the only game I could cite as having a Victorian setting in the mid 80s - just a while before steampunk and Space:1889.